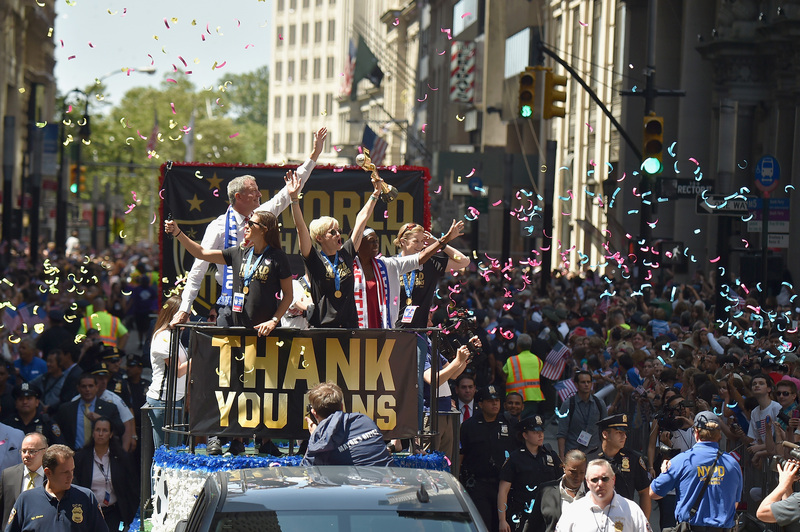 Friday morning saw Lower Manhattan taken over by a climactic celebration: The United States women's national soccer team (USWNT), three-time winners of the FIFA Women's World Cup, was treated to a parade in its honor. It was a wonderful day — soccer fans and New York residents lined up in their thousands to celebrate the team that brought the United States to the glory. But there's another side to the story: The USWNT parade had a dark side, and it's important to note that, too. Sports parades, like the sports themselves, can be enormously unifying and galvanizing events. And as such, they can provide a ripe opportunity to advance some sort of message. While it's often overlooked, politics often track closely with the world of sports, in spite of however many people turn to athletics for escapist reasons. At the end of the day, it's ultimately no different from any other part of American life — oftentimes morally and politically fraught. And there was no shortage of politics swirling around the parade. From the institutional side of thing, like the USWNT receiving substantially less in winnings than their male World Cup counterparts, to the functional, like how they were forced to play the Women's World Cup on artificial turf. In short, this world champion team has brought some major issues out in the open. So, maybe you're an average person working a regular job, and you don't have much sympathy for superstar athletes who're at the top of their sport. But you should care about equal treatment, and in this regard FIFA has done really poorly — the USWNT was awarded a mere $2 million for their victory, as compared to the $8 million awarded to all the men's teams that failed to make it out of the tournament's opening round. Yes, you read that right: a men's team that didn't win a single game would still take home four times what the greatest women's team on Earth did. And, as detailed by Huffington Post, the discrepancy looks even more stark when you add the total amounts paid to all teams in the field — $15 million for the women, and a staggering $576 million for the men. That, in simple terms, is a horrifying pay gap, and it ought to change. Regardless of whether the Women's World Cup reaps less profit than the men's version, the fact remains that a championship team should not be short-shrifted by virtue of its gender. After all, it's not like FIFA can't afford it. This stirred up a fair amount of controversy, considering the aforementioned tension over FIFA's treatment of male and female players. Basically, Major League Soccer (MLS) — the major, entirely male soccer league across North America — joined in on the parade with their own float, a fact which some people were not so thrilled about. Fortunately, it didn't end up being a spotlight-stealing affair — the float reportedly centered around promotion of women's youth soccer, which is a perfectly admirable message. But it nonetheless rubbed some people the wrong way, sparking criticism of MLS' relationship with women's soccer when the spotlights aren't as bright. The parade played host to some celebrators from reproductive rights organizations, and that deserves a little recognition: Much like women's soccer players, women's rights groups have struggled of late as abortion protections installed by Roe vs. Wade fall like dominoes. Therefore, it should probably come as little surprise that women's health advocates would be fired up about this historic team — staff from both Planned Parenthood and NARAL Pro-Choice NY were in attendance, as shown in tweets from the organizations. Where Are All The Sponsors? This might be the saddest single element of the whole parade, on par with the USWNT only earning one-fourth what the men's champ did. It also costs a whole lot of money to throw a proper, hero's welcome-style parade. And, as it turns out, the awesome spectacle Friday was brought to you in large part by... the state of New York! That's because of the alarming dearth of sponsors for the event. According to the New York Post, perilously few sponsors have backed the parade. In fact, so few sponsors stepped forward that the city is having to cover the difference. That's reportedly a whopping $1.5 million, money that ideally wouldn't need to be spent. The Post quoted the National Organization for Women's New York city and state president Sonia Ossorio, who put it about as well as anyone. If corporations are not falling over themselves to be associated with these champions, then they’re missing out. Everyone is watching, and these women are household names. I don’t know why companies wouldn’t want to be a part of this.